If you like reading, you would love a good book with a good story. Wouldn’t you? How about 18 of them in one book? Well that is what these 18 stories with varied emotions, varied themes and interesting twists have in store for you. 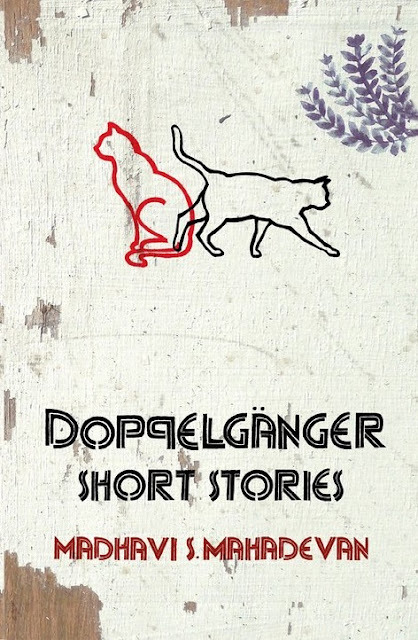 Doppelgänger: Short stories promises to be a great read. Promising to keep you interested with its dexterity of characters that spring out to your side and explain their versions and share their life with you. It is interesting to say the least as some of the stories really touched me. The pain, emotions and the easily forgotten small incidents we all encounter in life are portrayed with flamboyance. Madhavi S Mahadevan has carefully strung 18 different unique pearls, sorry soul stirring stories, on a nerve and served it up to us in this book. Doppelgänger, published by Alchemy Publishers, short stories explores the themes of isolation, anger, passion, inexplicable relationships, responsibilities, love, hatred and pure aggression among others and delves into looking at life as a roller coaster of events, small but significant, to change our perception about what normal life is. After all what is termed as a normal life? What goes on in the life of a normal individual? How often do we really care about the people who love us and care for us in the first place? Can you put a price tag on the love of a parent, sibling or the value of a relationship until you lose them? What can be the correct measure of passion or abuse? Hard to explain unless you get a close up chance to stare at the naked reality of truth and confront the hard blatant complexity of a double life or an extra marital affair and how these strange situations, characters come out and make bare their stories and life experiences with you. Overall the book is an excellent read and I love the selection set in modern India are highly recommend. To close here is a quote from the book. Chalti ko gaadi kahen, dekh Kabira roya"
Pick it up from Flipkart here. Pick #Airtel4G, the fastest network yet!